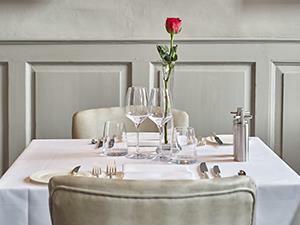 The Great House Restaurant and Hotel01787 247431work Restaurant with RoomsThe Great House Hotel is a small luxury 'boutique hotel' in the middle of medieval village of Lavenham in Suffolk, next to National Trust Lavenham Guildhall. This 15th century building with an imposing 18th century façade offers some of the best accommodation in the county. The five bedrooms, each with its en-suite bathroom and four with seating or a separate lounge are light and elegant still retaining the wonderful charm of the house. A multitude of hidden delights include a mini-bar, espresso machines, plasma screen television, Wi-Fi, HiFi, hair dryers and ironing boards and the complimentary fruit, bottle of water and decanter of sherry offer a welcoming touch. The Great House has received numerous accolades and awards over the 30 years that it has been owned by Regis and Martine Crepy lately the 2016 AA Inspector’s choice Award and AA three rosettes. The service is with a smile; knowledgeable and friendly, the all French team effortlessly ensure that customers thoroughly enjoy their stay. Lavenham is described as "England's finest medieval Town". Fine Tudor town houses mingle with small crooked cottages. Visit the magnificent "Wool Church", the famous National Trust Guildhall and the Little Hall Museum. Wander around the little streets with its shops, antiques, art galleries. The Great House Hotel is a small luxury 'boutique hotel' in the middle of medieval village of Lavenham in Suffolk, next to National Trust Lavenham Guildhall. This 15th century building with an imposing 18th century façade offers some of the best accommodation in the county. We are right on the Market Place of Lavenham by the National Trust Guildhall and the Little Hall Museum. All day Free parking available on Market Place. Children welcome from any age. From A134 or A1071 to Lavenham. When in the High Street, turn into Market Lane (OPPOSITE Timbers antiques). We are just behind the cross on the market place. Or turn up into Lady Street when in Water Street, then drive up to the Market Place. From Colchester - 12 miles Taxi or bus 753 to Bury St Edmunds via Sudbury and Lavenham. From Sudbury train station - either bus 753 or taxi (10 mins).